After a late night, foodie friend Jeremy and I headed to Kissaten for some food. I was so happy to go here because I've been wanting to stop by here FOREVER. 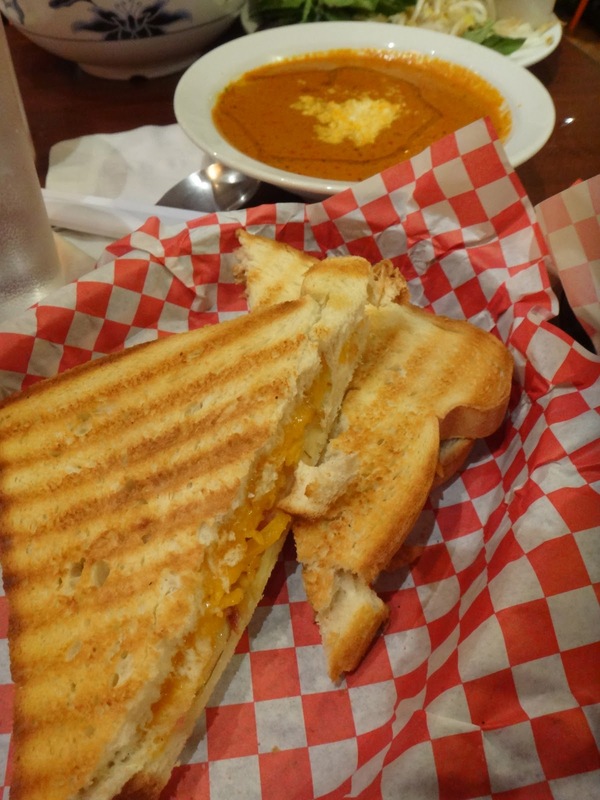 I always heard very good things about their Grilled Cheese and Tomato Bisque. Kissaten is a 24 hour coffee shop, and located right across Ala Moana in the KHON2 News building. I heard there are about 4 stalls in the building reserved for Kissaten, but there's always street parking too. If not, park at Ala Moana on the Sears side and walk down. Oh, FYI, Free Wifi with purchase, but limited to only 2 hours. Booooo. So the verdict? We ordered a TON of food (thanks to Jeremy! ), and I got to try 3 different items! 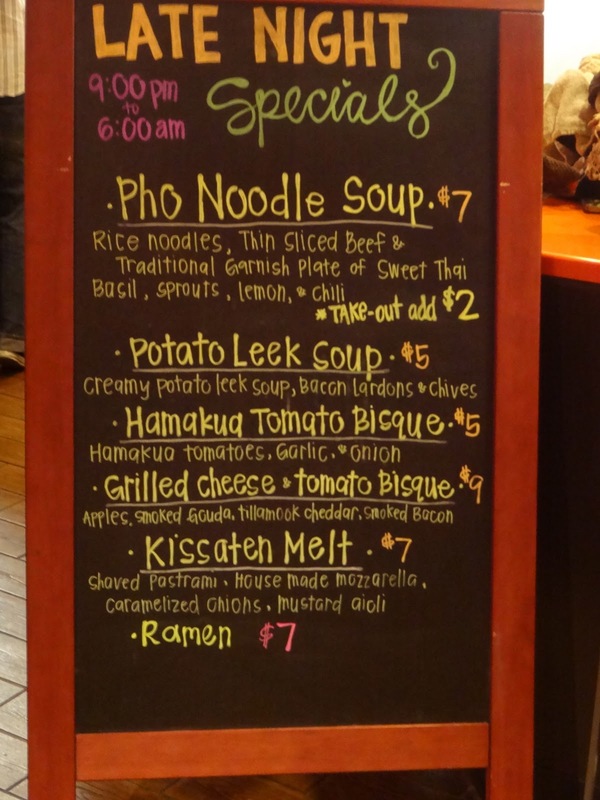 From the late-night menu, we chose Pho, Kissaten Melt, and of course the Grilled Cheese and Tomato Melt combo. After all the hype, I was not too impressed with the food. Pho broth seemed extra brown in color and tasted like they dumped some cinnamon in it. Weird. After adding some of each of the 3 sauces it came with, it started to taste a little better. I would definitely not come here for pho again though. The Kissaten Melt was a bit too sweet for me. Shaved pastrami, mozzarella, onions (yuck! ), and mustard aioli. Last but not least, the grilled cheese and bisque combo: Grilled cheese had apples in it, and cheese was barely melted! The bisque was the only thing I finished. Maybe if Starbucks is crowded, I'd stop here for a Chai or Hot Chocolate and relax here, but other than that, it won't be added into the mix of my lunch places. My favorite dish is the grilled cheese and tomato bisque. I'm sorry that your experience was not a good one. I agree with the pho. It doesn't look right. I've never been there but the food looks yummy! Happy Holidays from the FFF!